In his multifaceted oeuvre, Anton Stankowski (1906–1998) constantly pursued a total approach to design. 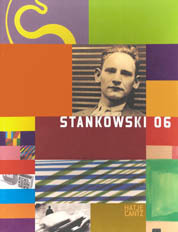 Having completed an apprenticeship as a decorative painter, Stankowski was influenced by the Bauhaus and the Zürcher Konkreten. Toward the end of the 1920s, his work in the fine arts concentrated on fundamental visual elements and at the same time, his masterful abstract photography, witty advertising graphics, and inventive company logos were excellent visual examples from the field of applied arts. During the post-war years, besides his logos for SEL, the Süddeutscher Rundfunk, and the Deutsche Bank, Stankowski came up with a theory of design involving visual planes, as well as numerous paintings and designs of high artistic merit. In honor of his 100th birthday, this monograph features the entire spectrum of his surprising innovations, which continue to set standards to this day.